Spring has sprung and summer is right around the corner. We want to help keep you informed of the coolest trends to excite your guests at your next outdoor event. 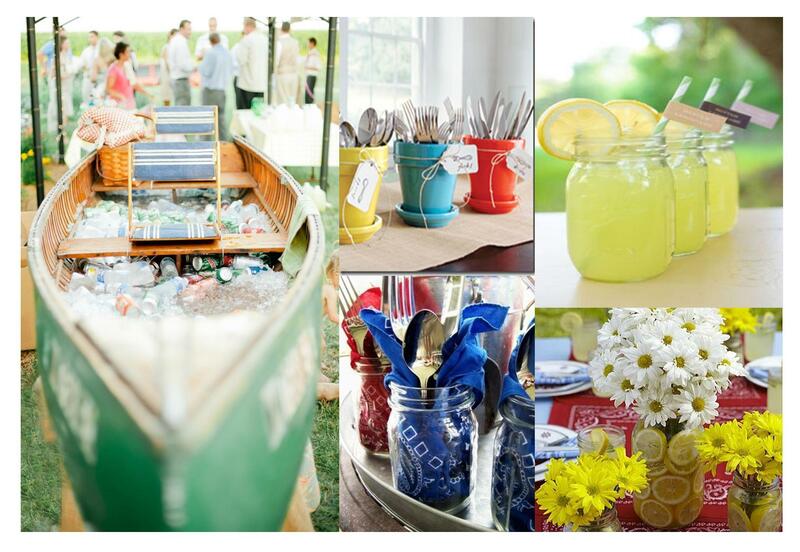 An easy go to décor item to add a little uniqueness to your party is the Mason jar. Mason jars can be used for drinks, décor or for silverware holders and they are better for the environment compared to a disposable cup. Another tip to remember when preparing for a home event is that the best décor can be located right inside your home. A simple solution for a silverware holder is pictured below in painted or colored flower pots with handmade tags. Another fun way to jazz up your party image is by using of a nontraditional vessel to ice down your beverages. A canoe filled with ice cold drinks is a much “cooler” approach than a plastic drink cooler seen (or sat on) at every outdoor event. Adding a few special touches to your party takes it from ordinary to extraordinary! Give us a call today and we can help you with all of your party needs.